Bring the story of this historic First World War battle into your classroom. In August 1917, only months after their victory at Vimy Ridge, the Canadian Corps led an attack on Hill 70. It marked the first time that they were commanded by General Arthur Currie. More than nine thousand Canadian soldiers were killed or wounded during the battle, but it was a Canadian victory. They showed their perseverance and determination as fighters, beating back twenty-one counterattacks and having six soldiers receive the Victoria Cross, the highest recognition for military valour. The Hill 70 Memorial Project has developed an extensive education program to engage students in learning about this historic battle and the First World War as a whole. Their Learning Kit provides a suite of hands-on materials for use in elementary and secondary school classrooms. Based upon an inquiry model and the historical thinking concepts, all of the lesson plans and supporting materials are available for download on their website. 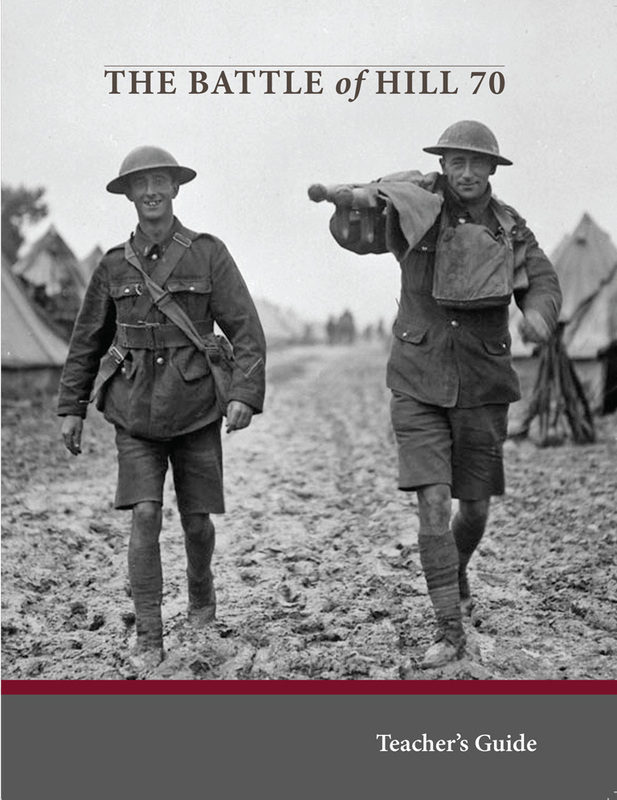 The Hill 70 Memorial Project has also released several books and publications which will appeal to a variety of readers. Their graphic novel, The Battle of Hill 70, engages students with the story of this major Canadian battle. It chronicles Lieutenant Brock Chisholm, who led the platoon of the 15th Battalion on an assault on Hill 70. He was awarded a Military Cross for his efforts in the battle and later became the first director of the World Health Organization. Students can also participate in a history “hack-a-thon.” Using the Hill 70 website, students research individuals who died during the Battle of Hill 70 and build a virtual memorial. The Hill 70 Memorial Project seeks to educate and commemorate overlooked First World War victory. Veterans Affairs offers free, bilingual resources, in hard copy and electronic formats, so students 5 to 18 years old can learn about those who served and why we honour them. Use this twelve-question quiz to get your students reading and thinking about the Battle of Beaumont Hamel. Use this word search to familiarize your students with some great Canadian firsts! The Historical Thinking Project website features exemplary lesson plans that explain how to get your students thinking historically. As soon as children can say, “That’s Not Fair!” they are ready to talk about their rights and freedoms. Explain and expand upon the concept of unceded land.